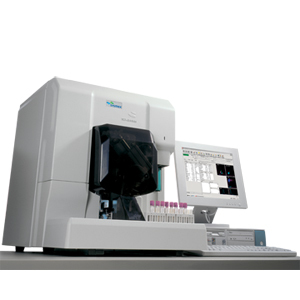 The Sysmex XT-2000i Automated Hematology Analyzer utilizes the power of fluorescent flow cytometry and hydrodynamic focusing technologies. Using a unique diode laser bench, Sysmex fluorescent flow cytometry provides the sensitivity needed for measuring and differentiating cell types in whole blood and body fluid samples.Fluorescent flow technology and hydrodynamic focusing enable the XT-2000i to consistently classify normal WBC, RBC and PLT populations form abnormal populations, thereby decreasing the number of manual interventions. XT-2000i technology provides clinically relevant and reportable parameters.